- For mainframes without a low frequency (RCA) output (eg, cassette reader/card reader/CD/VCD/DVD), converting the high frequency output of the horn to a low frequency (RCA) output to a car power amplifier or subwoofer. - Convert high-frequency output to low-frequency output, true channel separation, adjustable input sensitivity and high quality. - Reasonable design,high-quality electronic components ensure superb load-carrying power, long-term durability and excellent sound quality. 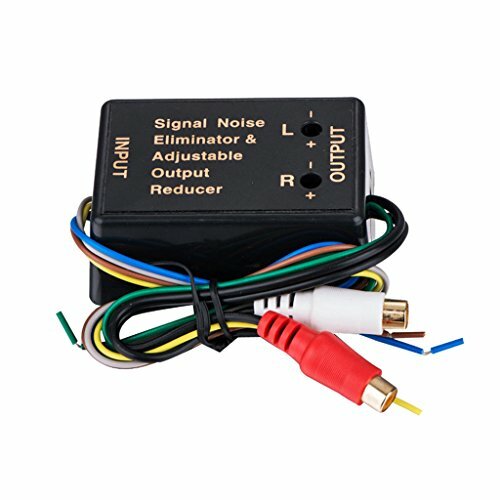 - A wonderful tool for you to use this amplifier on your car, motorcycle, golf cart and other places, where you need small amplifier in order to have a better listening experience. - If you want your audio details to perform well, the sense of hierarchy is more distinct and prominent; choosing it is equivalent to choosing a surprise. For mainframes without a low frequency (RCA) output (eg, cassette reader/card reader/CD/VCD/DVD), converting the high frequency output of the horn to a low frequency (RCA) output to a car power amplifier or subwoofer. Convert high-frequency output to low-frequency output, true channel separation, adjustable input sensitivity and high quality. Reasonable design,high-quality electronic components ensure superb load-carrying power, long-term durability and excellent sound quality. A wonderful tool for you to use this amplifier on your car, motorcycle, golf cart and other places, where you need small amplifier in order to have a better listening experience. If you want your audio details to perform well, the sense of hierarchy is more distinct and prominent; choosing it is equivalent to choosing a surprise.